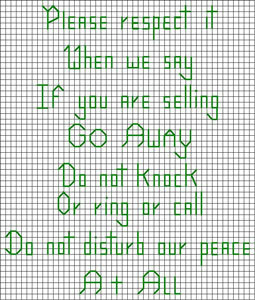 I grew tired of being constantly disturbed by door-to-door salesmen, so I composed this poem and cross stitched it onto a sampler. I hung it on the inside of my outer glass door, and happily, most of the salesman now either bypass my house, or quietly leave literature. I used 14 gauge material, cut to size and simply stitched a border around it, but to save time, you can affix any type of border to the canvas. It can hang on a dowel, but I went with the 'rustic' look and used a branch. You can fringe the sides and bottom for a slightly different look. Click Here to get a higher resolution version of the poem for printing. Great idea! I think I will make one too. Ahaha I love it! I think I will make one!